The closure of military bases is fraught with political peril, since they pump millions of dollars into state economies. So, when members of Congress learned that the reduction of 50 nuclear-armed nuclear missiles could shut down Air Force bases, they pushed for a compromise to keep them open. The number of land-based nuclear missiles is being reduced in compliance with the New START treaty that the U.S. signed with Russia in 2010. The U.S. plans to remove 50 ICBMs from their silos over the next four years—the missiles won't be eliminated, but decommissioned and placed into storage. But, the removal of 50 missiles would be sufficient to close down an entire Air Force base, which didn't sit well with lawmakers representing the states that are home to those facilities—Montana, Wyoming and North Dakota. In response to the outcry, the Defense Department agreed to remove a handful of missiles from each of the bases. The empty silos would be kept operational (known as "warm status"), and the bases would continue to maintain and guard them—in case the U.S. ever planned to put the missiles back in service. As a result, all of the ICBM squadrons remain operational, and there's no need to shut down the bases or even layoff any personnel. The decision to largely spare land-based missiles is at odds with the recommendations of some outside experts, who have called for eliminating or deeply cutting the Minuteman III and relying instead on submarines and bombers to carry nuclear weapons. Bruce Blair, a former ICBM launch officer and founder of Global Zero, a group that seeks elimination of nuclear weapons worldwide, said it would have been more cost effective and "strategically sensible" to eliminate an ICBM squadron. Because it is in a fixed location, a Minuteman III missile is more vulnerable to a surprise nuclear attack and therefore would have to be fired quickly in a crisis, making it more destabilizing, Blair said. "It is designed strictly to fight a large-scale nuclear war with Russia," he said. Still, Congress got what it wanted, and that should have been the cue for everyone to declare victory and go home. However, Representative Steve Daines (R-Montana) has now added an amendment to the National Defense Authorization Act, which would block funding to decommission any additional silos that currently house ICBMs. This section would impinge on the President's authority to determine the appropriate force structure to meet nuclear deterrence requirements, to determine the number of strategic delivery vehicles needed to meet national security requirements, and to implement changes in those forces. While it is the President's determination that 50 of the current 450 Minuteman III silos will remain in a non-deployed—warm—status, this provision would tie the hands of all presidents with respect to force structure….Moreover, as the Department currently plans to perform routine testing and maintenance on some silos, which would temporarily isolate them from the interconnected and redundant command and control system of the missile field during overhaul, the provision as drafted could prevent the Department from conducting this necessary testing and maintenance. In other words, this amendment, if passed, would effectively prevent the president and future administrations from permanently eliminating any additional ground-based missiles, if they ever choose to do so. It also prevents the White House and Department of Defense from changing the balance of the nuclear arsenal, if, for instance, officials should decide to shift more nukes to submarines. 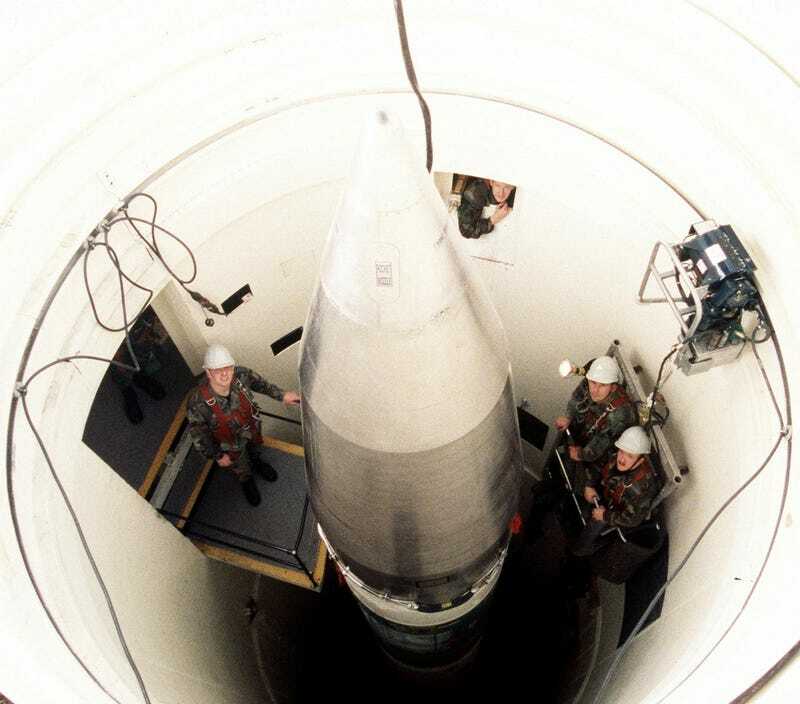 Such a situation occurred on May 17 when a missile crew was performing standard post-maintenance tests on an ICBM assigned to the 90th Missile Wing at F.E. Warren AFB in Wyoming. The crew received system indications from one of its launch facilities that required a maintenance response, said Lt. Col. John Sheets, spokesman for AFGSC. While on site, the maintenance team found abnormal indications on the missile, was unable to resolve them in the field and took steps to ensure the site was safe, Sheets said. "The missile has been taken offline to facilitate a full engineering assessment and safety investigation," Sheets said.